Macarons. One little word, one little meringue confection, and one little bite that sends us all swooning. The French are to be congratulated on their fine achievement in the creation of the macaron. Hats off. Truly. Years ago, I tasted my very first macaron. It tasted aweful. Dry, sickeningly sweet, no flavor in the filling, and after that unpleasant experience I avoided the very sight of them. I couldn’t understand why people loved them so much, but it didn’t matter since they were not something I came across very often. A few years later, I found myself traveling in France and they were everywhere I went. They were far too beautiful to pass up. Standing in line, at Laduree, I picked out my small box of six flavors. I was in no hurry to try them and it wasn’t until later that evening that I pulled out the lovely gilded pink box and unwrapped my first macaron. It was small, with smooth shells, delicate little raised feet, and lightly colored to reflect the filling flavor inside. It was divine. The shells were the texture of little cakes and the filling was just the right amount to balance out the shell texture. I have many food memories, but only a few of them as pronounced as my first real macaron. I was a convert on the spot. I finally knew what macarons were supposed to taste like and have ever since been striving to create the perfect macaron. Macarons are notoriously finicky to create and they often give even an experienced pastry cook a certain level of anxiety. The secret to creating macarons: practice, practice, practice. There are a million tutorials and tips out there to help anyone courageous enough to tackle the challenge. 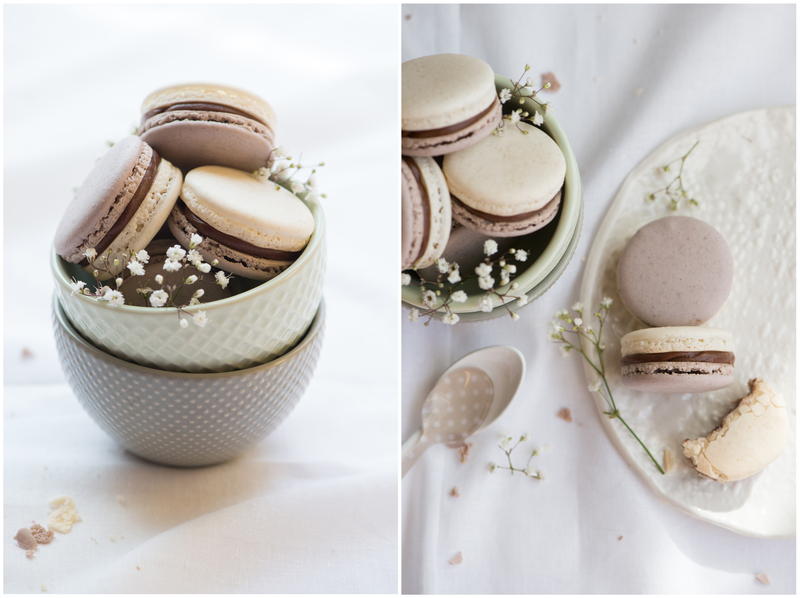 The reality is, macarons are not really that difficult to make…. once you become acquainted with how your oven behaves and how to properly do macaronage. The French term for the process of folding together your egg whites and almond-sugar mixture. Essentially, macaronage is about knocking out the air in your macaron batter. The trick is to knock out the right amount of air, not too little and not too much, every single time. This is why practice is your greatest teacher. Do not become discouraged if your first few attempts (or even several- hang in there), do not turn out with perfectly raised feet, or smooth surfaces, or if you end up with an air gap in your shells. Even a less-than-perfect macaron tastes delicious. 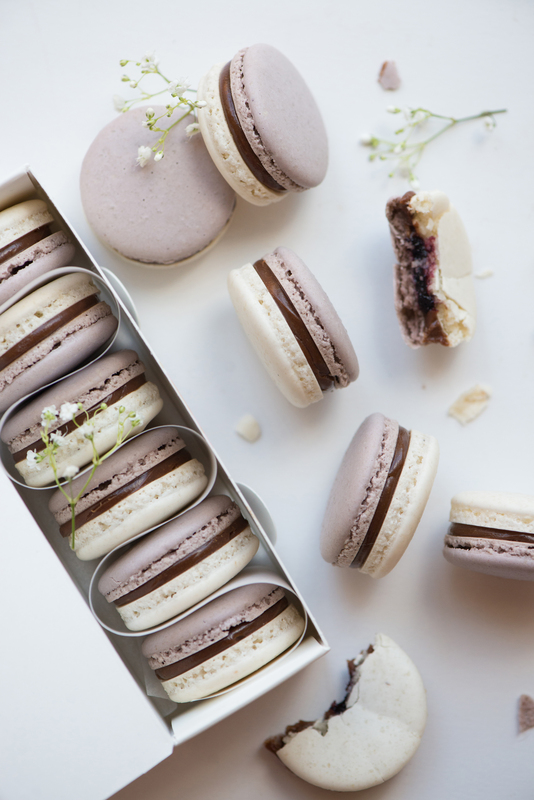 There are infinite flavor possibilities with macarons. The best ones are not too sweet and have a light filling. The filling is what actually flavors the macaron. Ganache is a common filling used; however, buttercream is equally delicious and versatile. 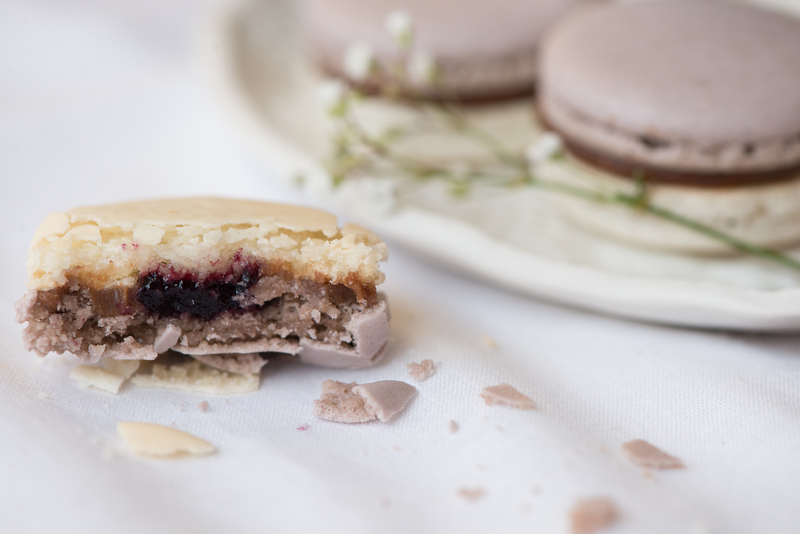 I am not a fan of pastries that are too sweet, so when I created this Earl Grey Cassis Macaron I chose to add a contrasting tart flavor in the Cassis confiture to balance out the Early Grey ganache. Another very important step, when making macarons, is to allow them to mature and rest in the refrigerator for 24 hours. It may seem like an eternity, but it is well worth the wait. The texture improves dramatically by allowing the filling to soften the shells and develop in flavor. Enjoy! Sift together the confectioners sugar and almond flour, in a medium sized bowl. Add the first portion of egg whites, but do not stir. In a stand-mixer bowl, with a whip attachment, add your second portion of egg whites. In a small pot, bring the water and sugar to a boil until it reaches 118C. Be careful not to splash any sugar-water on the sides of the pot to prevent crystallization. If you do, use a small pastry brush dipped in cold water to brush down the sides of the pot. When the syrup reaches 110C, simultaneously begin whipping the second portion of egg whites to soft peaks. When the syrup reaches 118C, gradually, in a steady stream, pour the hot mixture into your whipping egg whites (set your mixer speed to medium-low and pour the syrup down the side of the bowl to keep it from being sprayed on the sides of the bowl by the whip). Turn up your mixer speed to medium-high and allow the meringue to whip and cool down to at least 50C. Meanwhile, combine your first portion of egg whites with the almond flour and confectioners sugar. If using, add your food color now and mix until the desired color is achieved. You will want to go darker with the color since the white meringue will lighten the finished color. Fold your meringue into the almond-sugar mixture, in three additions. Add your first third, fold it to loosen the almond-sugar mix. No need to be gentle at this stage, as you want to fully incorporate the meringue into it so that it is easier to fold in the remaining meringue. Add your second third, this time folding gently, until you see no white meringue streaks. Add your last third, folding gently, until you see no white meringue streaks. At this point, you may add any additional food coloring that you’d like if you need to adjust the final color. Now, check the consistency of your macaron batter. You want a glossy batter that resembles slightly runny cake batter. It should flow down nicely and with few breaks from your spatula when you hold it up high over the bowl. When the batter falls into the bowl, it should smoothly flow back into the batter in a matter of seconds. If it does not, simply give it a few more gentle folds and recheck your batter. Slowly, keep doing this until your reach the desired consistency. Line a large sheet pan, with parchment paper or a Silpat. Prepare a large piping bag, with a small plain round tip, and pour in your macaron batter. Hold the piping bag vertically and begin piping 3/4″ to 1″ round shells onto your sheet pan, spacing them about 1/2″ apart. Once you have piped an entire tray, lift up the tray and rap it lightly on your work surface. This act will remove any air bubbles and help prevent them from bursting in the oven. Set aside for 30 minutes to allow a skin to form on the surface. The batter should not stick to your finger when lightly touched. Preheat your oven to 163C (325F). Bake for 12 minutes, until the tops are set and don’t wiggle when you gently push them to the side. Remove shells from the oven and slide the parchment or Silpat onto a cool work surface. Allow them to cool completely. Carefully, remove the shells from their surface and begin pairing the sizes up. They are now ready to be filled. *Aged egg whites are used in this recipe, in order to allow the whites to liquefy and lose their elasticity (the break down of their albumen protein). They become easier to whip to soft peaks and improve the texture of the macaron. If you do not age you egg whites, do not fret. Go ahead and use your same-day separated whites, at room temperature. Recipe adapted from Pierre Herme, Macarons. In a small saucepan, mix the cream and glucose and bring to a boil. Remove from heat and add tea leaves. Cover and steep for 15 minutes. Meanwhile, melt your milk chocolate in small stainless-steel bowl set over a small pot of simmering water. Remove from heat when it is just melted. Wipe any water off the bottom or your bowl carefully and do not to allow any water to touch the chocolate. Strain the steeped cream into a clean bowl and weigh to four ounces. If necessary, add cream or discard some of the liquid to reach four ounces. Pour the chocolate and cream into a bowl and using an immersion blender, combine the two. You may also use a spatula to combine the mixture, starting with small circles in the center and working your way out to the sides of the bowl to create a smooth emulsion. The ganache will thicken, become shiny, and develop a puddinglike consistency. Add the butter and incorporate with the immersion blender. Allow the ganache to cool slightly until the consistency is able to hold it’s shape. Place ganache and cassis confiture into separate piping bags, with the tips snipped off. Pipe a ring of ganache around the edge of the macaron shell and then pipe the confiture into the small gap in the center. Place on the paired-up “top” to the macaron, press gently until the filling reaches the edge of the macaron. Continue until all pairs are filled. Place the filled macarons side by side on a tray, cover with plastic wrap, and refrigerate for 24 hours before serving. Remove them from the fridge two hours before serving to be enjoyed at the the ideal temperature. Recipe adapted from Michael Recchuiti, Chocolate Obsession. hi. Your Macarons are beautiful! Would you mind telling me which color you used to color your macs. That steely-lavender is stunning. Did you use a gel based color? Thanks for sharing! Thank you! I used a red terra cotta powdered color (non-toxic) that I ordered online. I really love the subtly that powdered colors provide. You can add as much as you want, depending on how deep you want the color of you macarons shells to be. I hope this helps. Hello Teresa ! Your macarons beautiful !. Thank you for sharing your recipe ! As you do to remain flat and not type the chubby burger tapas, I explain ?. Because your macarons are different from those seen in general and the appearance strikes me !. You are using normal or pasteurized whites egg? That way it will mix flour with meringue ? What is the secret ? I use regular store-bought eggs and separate the yolk from the egg white. No secret about it. :) Yes, some people’s macarons come out looking “chubby” and others not so chubby. Either way is acceptable and both taste delicious. The different appearances probably stem from the type of recipe used, to ingredients, how the macaronage is folded, oven temperatures, etc. Each of us has our own personal touch and way of doing the exact same process. In turn, we each have slightly different results. My advice, just keep practicing and making macarons. Once you create a batch that you love, just keep trying to recreate that process over and over. Good luck and hope all is wonderful in Uruguay! I’ve been using this recipe for some time now, and it’s the only one that gives me smooth tops and feet in macarons. I’m wondering what box you used to store the macarons in the pictures and where I can buy it? Thanks! Hi Molly, so glad to know that you’ve had success with this macaron recipe. I honestly can’t remember where the box in this picture came from, but my guess is that it’s an old recycled macaron box from a pastry shop I brought home on one of my vacations. If you search online you should be able to find some affordable macarons boxes to purchase in bulk. Best of luck!